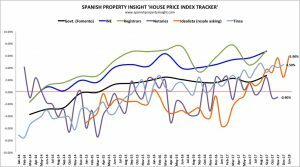 Spanish Property Insight’s house price data graph above is a fascinating study of the vagaries of statistics. Of little use to individual homebuyers in specific locations, each index provides a general indication of where the compiler’s data shows the market has been and based on that, others make interpretations of where it’s likely to be in the future. Let’s look at these indices in turn. Fomento – (Ministry responsible for planning and implementing Govt policy on Public Works and Transport) – presumably they will get their statistics from the other government agencies, being principally the tax authorities who are fed the information from the Registrars and Notaries. Thus, their statistics should follow these two. Their graph looks pretty constant with fewer fluctuations so perhaps it’s their statistical technique that is levelling it out. INE – the National Institute of Statistics states on their website that one of their objectives is to provide an element of comparison between EU member states. The stated source is Notary information, so it should mirror the Notaries’ graph. Unfortunately, it does not. Perhaps, once again, there is a levelling out due to statistical methods and possibly also lagging information being received from the Notaries. Title Registrars – this will record the actual price stated on the Escritura’s (title deeds) that are recorded in the local Registry. Unfortunately, this will not record the undeclared payments that are reputed to occur in many transactions. As I’ve stated in earlier articles, as the money-laundering regulations bite, there is less undeclared, which would give the impression of house prices rising even if it was a steady market. The Registrars graph still shows a gradual and steady pattern, though significantly different from the first two above. Notaries – Now we are getting closer to the frontline of the property market. One would expect their graph to be very similar to the Registrars as the Registrar only receives the information via the Notary. Perhaps there will be a time lag due to some Notaries working faster at transferring information than others or their being complications requiring confirmation of unrelated matters, which again may delay the passing on of the information to Registrar. This could also be due to timing of titles being put forward to be registered, perhaps linked to tax dates and the like, and not even those of only Spain as the buyers and sellers come from all over the world. However, comparing the two graphs, they are wildly different, with the Registrars’ much more steady record being at considerable variance to that of the wildly fluctuating Notaries’. Idealista – (resale asking prices) – this is a commercial multi-listing organisation. Private vendors can place details of their properties on the website for free, whilst estate agents have to pay for their bulk entries. They state that they have more than 1.5 million properties for sale or rent, but there appears to be no effective control to avoid duplication and encourage accuracy. Working as we do with estate agents’ online details, we know that one property can be entered three or four times, all with the same photographs, but with widely different floor areas, accommodation, description and prices. Some of the properties will have been on the website for many years, showing historic prices, whilst others will be short-term and regularly updated. As one would expect, this graph fluctuates, but not quite so much as the Registrars’ and Notaries’. There are significant dips and rises that are not reflected in any other graph, which may be is a result of them concentrating on resale prices and not new build. Tinsa – this is one of the largest firms of mortgage valuers (tasadores), regulated by the Bank of Spain, and working on behalf of many commercial banks and lenders. 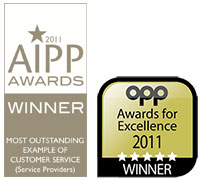 To have a mortgage registered it is essential to have a Tasador valuation linked to the document. The tasadores obtain their information from the market, through multi-listing sites such as Idealista, Fotocasa and the like, but principally from their own statistical records, being previous valuations in the area. Whilst helpful for maintaining consistency in values, it does mean if there is any error that it will tend to spread through the valuations in that locality. In addition, as it’s much easier to access lists of valuations within one’s own organisation than to carry out searches through estate agent and lawyer contacts, and general Internet searches, there is probably a bias towards using their own figures, sometimes without checking with the market. In addition, the tasadores are obliged to put forward their value net of all selling costs, which can be 10 to 15% of the registered sale price, and this can be the reason for so much frustration and disappointment when buyers are seeking maximum mortgage finance depending upon a generous valuation for the property. Tinsa’s graph shows variation, but not nearly as marked as the Notaries or, interestingly, Idealista’s from whom they will get some of their market knowledge. 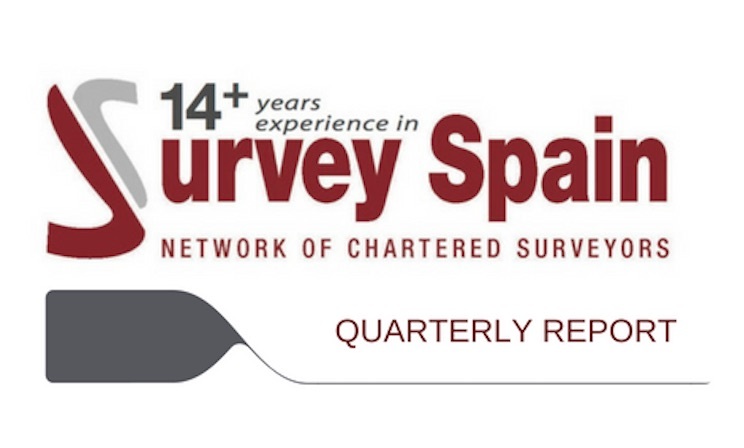 So how do statisticians employed by banks, governments, EU, IMF, etc provide accurate analysis of the property market in Spain? A graph line combining all the ones above, would undoubtedly show that there is a marginal upward trend from the depths of 2014 to today. That’s really all that one can ascertain from it. For homebuyers and sellers wanting to know what the current market value of an individual property in the local market is, the graphs are of little use. Yes, some of these organisations provide local statistics, which will be more helpful, but again they will be subject to all the vagaries mentioned above. The only way to really know on any particular day is to check what is actually on the market and have sufficient expertise and individual knowledge to be able to compare one unique property to another. That’s why property valuation is described as part art and part science, with valuers having to be psychologists ascertaining the mood of individual buyers and that which is ‘created’ by the particular property and its immediate environment. Property developers and investors and, indeed, local authority infrastructure planning officials have an even more difficult time making sense of things due to the considerable time lag between initial conception of a project and it being supplied on the market. The former don’t know what is being planned by others in the same physical market area as their own proposed development, and thus there can be wild excesses of supply, such as can be seen to be happening now in some areas on Costa del Sol. The infrastructure planners know the applications that are being made but have no control over what will arrive the next day and only limited powers to control the market. Local and national politicians, who create the regulations, do have these powers, but they are also responsible for the finances of the government, which, in many local, provincial and regional areas are principally dependent upon construction licenses. Some, such as in the Balearic Islands, have been able to regulate construction and thus control the market, but this has been largely perceived as due to political dogma rather than a desire to genuinely provide a logical market serving everyone.